Do you like art? Want to learn different techniques and skills; and play with different mediums? Come join the Guild at one of our free workshops. Open to everyone over the age of 18 - we offer an opportunity for you to explore art and your creativity. About 30 years ago, a small group of local artists got together to paint, share their experiences, and critique their art. The group grew in size, and in time they formed the Oak Island Art Guild with the mission "to further the cultural arts for the residents of Oak Island, NC, and vicinity; to provide workshops and/or instruction for members of the community; to cooperate with other community organizations in furthering the cultural arts; and to organize and participate in visual arts shows." Members of the Guild still get together monthly. January to October, on the second Friday at 9 am, there is a business meeting, followed by a workshop conducted by a guest instructor. The workshops vary and include drawing, painting, pottery, collage, stained glass, and more. In November, the Guild, in cooperation with the Oak Island Recreation Center, sponsors an arts and crafts show, Arts by the Shore. In December, the group meets to celebrate the holidays and elect officers for the coming year. 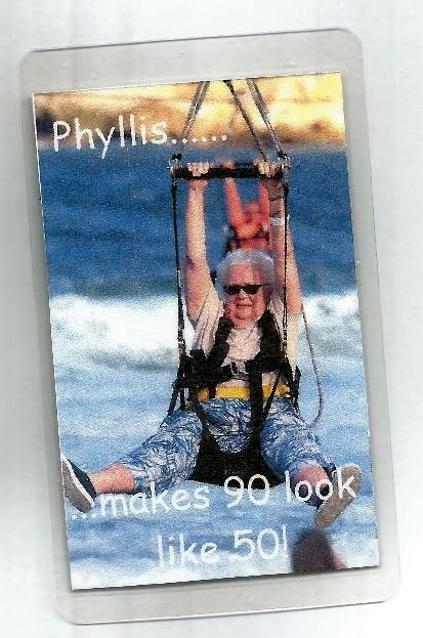 Phyllis Riley, a founding member, celebrating her 90th! Art Smart in mind, body and spirit! This is an interactive map with the Oak Island Recreation Center marked. To use as a driving map, make the map larger or smaller, move east or west, north or south, using the arrows on the left.